Recently, I had the opportunity to visit Paxos, one of the Ionian Islands. 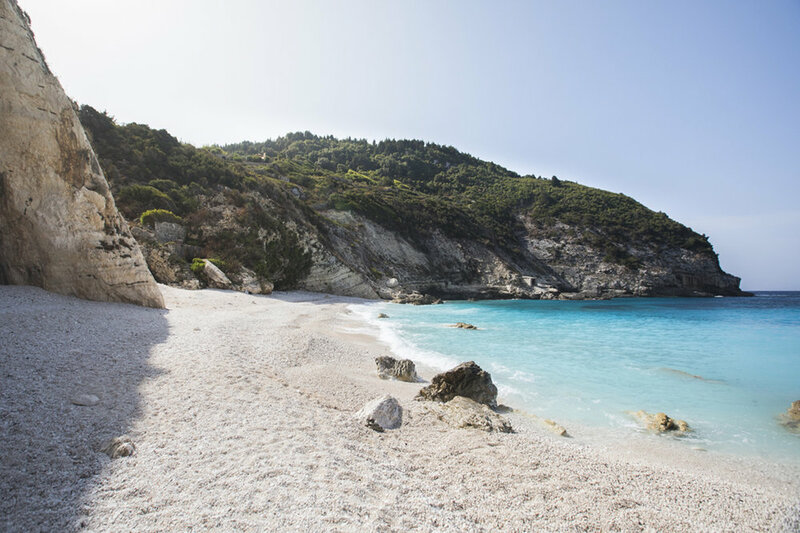 Paxos is located in the north west of Greece and south of the Island of Corfu. With crystal clear water and beautiful beaches I knew this little paradise would be a unique place for me as a photographer to capture. On this trip I visited some of the many highlights, which I would like to share with you here in this blog. Find the Dutch version of this blog here. I spent my first night in Corfu, in the amazing Kontokali Bay Resort & Spa resort. Which is located on the water's edge and has a magnificent view of the mountains of Albania. Only 5 minutes away from Corfu town, it was the ideal base for those who want to explore this pretty city. After a relaxing overnight stay, I was completely energized and ready to continue my journey around the island of Paxos. Paxos can only be reached by boat and this destination is also often visited as day trip by people who want to view the impressive cliffs of the Paxos and AntiPaxos islands from the water. I stayed there for several days and left with the high-speed boat of the ÎšAMELIA line. This trip departed from Corfu Harbour and arrived in Paxos, New Harbor. The duration of the trip lasted for about one and a half hours. This trip alone was really worth it. You experience many great attractions, like sailing past the historic Venetian fortress which is located on the original site of the ancient city of Corfu. You can also see the mountains of the Greek mainland fading into the distance. It is a wonderful view to dream away. A great way to explore this wonderful island is with a rental car or to perhaps even walk around. My tip though would be to rent a scooter. This way you get to see a whole lot more and enjoy all of those small roads, that seem to lead you to the islands most beautiful beaches. It also allows the wind to blow in your face while driving and it makes for a refreshing outdoor experience. My hotel was centrally located and this made it an ideal location for me to further explore the island. I visited a number of beautiful beaches, dreamed away with some spectacular views and ate delicious food in the many taverns scattered all around. Paxos really surprised me and showed that there is much more to see and do besides relaxing on the beautiful beaches. Take a stroll along the mountains filled with olive trees, enjoy the great gastronomy, exotic diving in crystal clear waters, sail besides the impressive rocks and cliffs. Or simply enjoy one of the cosy taverns that are found across the island. There is definitely something for everyone. Paxos is therefore highly recommended and well worth a visit. My 5 tips for a visit! Ok, this place might be a bit obvious, but the food found here is simply just great. It blew away my expectations and the food was delicious and affordable. The terrace is located on the central square and offers great view of the yachts and the pretty harbour. Here you find great customer-friendliness and a unique cosy feel. It is definitely worth it! Where on this island is it not relaxed? There are so many relaxing, beautiful places to be found on this island. In this quiet town I found some perfect opportunities to relax. The view, the rippling water, the sound of the ropes tapping against the side of the boats, the fresh squid on my plate, combined with a refreshing drink ... for me this was the perfect place to unwind. My little secret: Panoramic viewpointWhen you drive from Paxos New Harbour towards the town of Gaios, take the road that goes uphill. Here you pass a panoramic viewpoint where you have a great views over Gaios and the harbour area. For the early birds amongst us: this point is also the perfect location for a sunrise. The hip Erimitis Bar & RestaurantGreece is known for its beautiful sunsets. There are many places on Paxos where you can admire this. Add delicious cocktails, fantastic food and a breath taking views and you'll end up at Erimitis Bar & Restaurant. This is the best place to be! The beats of uplifting music, the laughter and the glasses being filled, well into the small hours. What a top spot!